I'm using the content library in SL360 and when I download an image it is resized to automatically fit the size of the story. Is there anyway to download an image from the content library and make sure it stays at the resolution shown? I'd like to use some of the images in Rise but when I save them and import them they look awful because they low resolution. For the best results, we recommend using a standard 4:3 or widescreen 16:9 aspect ratio. However, slide templates will automatically adjust to fit custom slide sizes. In most cases, you won't need to make any changes after importing a template, but if your slide size is unusual—for example, portrait oriented or extremely widescreen—you might need to resize some objects to fit properly. Are you having difficulty using something? If so, I'd like to better understand. We are aiming for integration of the stock images from Content Library with Rise to be available within the next couple of months, so stay tuned. At this time, Content Library assets work exclusively with Storyline 360 and Studio 360. What I would like to do is actually download the image instead of inserting straight into Storyline. While the images are fantastic and this new feature saves me hours and money it would be nice to have them in their format and size that they are listed as. Is this something that would be possible in the future? Hello Dave - Thanks for your explanation. I can see where that would certainly be helpful in the example that you've shared here. I have submitted your idea and thoughts as a feature request on your behalf. Frankly, I just don't know if that's on the horizon. That's a big hidden downside to the Content Library. It appears you can only use the images unaltered. I wanted to give all the images a colour tint for design reasons but you can't actually download them and edit in Photoshop. You can only insert them unaltered into Storyline/Rise. Guess this might be to do with the license? Or am I missing something! 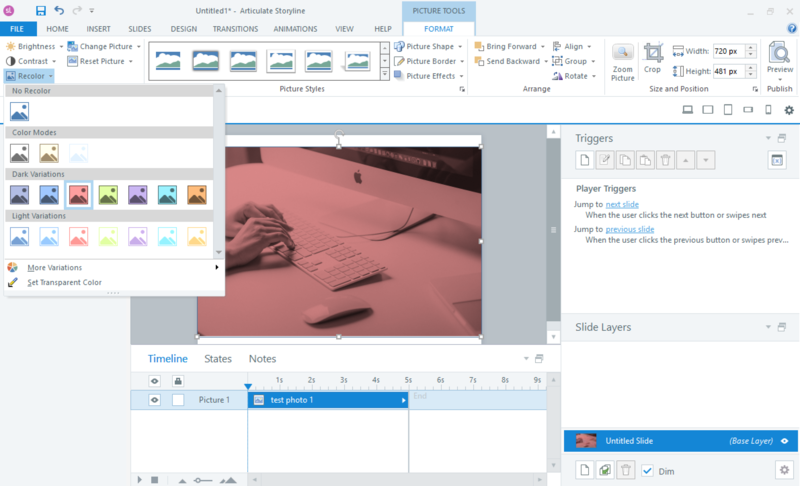 You can certainly add a color tint to your Content Library additions within Storyline. Downloading and editing the images has come up a few times and you are welcome to share your thoughts and use case with our team here. Actually I'm using Rise for this project and that doesn't have that feature. Generally though is my understanding correct - you can only insert images into Storyline/Rise - you can't download in order to edit in Photoshop? I guess a workaround is to insert into a blank slide in Storyline then clip and paste into Photoshop but this would lose quality. Correct - Rise doesn't have that feature to adjust the coloring. You can do it within Storyline, but there isn't a method to download them directly out of Content Library onto your desktop. The image is inserted directly into Rise, and will behave as any other standard photo with the formatting and right click menu available. In case it helps, here's the link to the Terms of Service, as the Content Library assets are for Articulate 360 exclusively. Thanks Ashley. That's what I thought. The license only allows use in Articulate 360 output. I too would like the ability to download the full, high-resolution photo. I may only want to crop the photo to use only a portion of it but still make it fill the screen. Or as others suggested, modify it in Photoshop and then bring it into Storyline. Having a really high resolution image also helps if you're wanting to do a zoom region, otherwise the photo gets pixelated looking when you zoom in. Thanks Tom, currently the images and assets of Content Library are for use in Articulate 360 tools exclusively, but if that changes we'll definitely let you know! What I'm noticing is that the images are not as sharp once they're inserted into a Storyline 360 slide. I'm seeing some JPEG compression artifacts. So if you want to use an image full screen, it doesn't look nice and crisp, even if it was a high resolution image to begin with. One suggestion would be to have a setting within Storyline 360 so that when you download an image you can select if you want it to retain the full high resolution of the photo or to resize it to fit the slide. That's a great suggestion, Tom. I'll pass it along! And in case you're wondering what happens when you share a feature request, here's an inside look at our process. The other problem that I have run into, using the high-resolution photos directly from Content Library into my Storyline 360 course, is that because the pictures are so large, and the entire photo stays within the Storyline file, that the program started to be so slow and lag so much that I couldn't work with it at all. The drag/delay kept me from being able to move or resize boxes. Once I stripped the images out, it worked just fine. The images in the Content Library are WONDERFUL. They are just too large as is. Having the ability to save them and adjust the resolution settings of the image, not just sizing the part that is shown in the program, would be EXTREMELY helpful! I'm sure part of the reason it is this way is to keep us from using those images in other programs, which I understand. Perhaps, like others have suggested, there would be more freedom to truly crop, resize, and adjust the image resolution within Storyline (or Rise) so that only the parts or size of the image that is needed is retained within the file? Or - make it possible to adjust the resolution or size of the photo in Content Library BEFORE it is downloaded and inserted into the project. I haven't heard the experience that Content Library images and their size is slowing down Storyline, but I know our team is checking into performance issues with Storyline 360 as a whole. I'm going to share this insight with them as they keep digging in! As for cropping or editing them, the Content Library assets are designed to be used exclusively in 360 apps. Even with that being said, downloading and editing the images has come up a few times and I'd love it if you'd share your thoughts and use case with our team here. I, too, would like to edit some of the images. I certainly understand Articulate's desire to keep them close to the vest, though. Maybe a low end editing facility within 360 and Rise that does not export? Also, I used an image from the library, but it did not position well - is there a way to reposition? - but I did find a version of the same image in Unsplash.com. Images that can be used for any reason without payment or even attribution. Odd but true! Hi there, Rick. When you insert an image from Content Library into Storyline, you can resize and move it like any other image. Are you having some trouble working with images in Storyline? I am working in Rise. Should have made that clear. We have a feature request logged for more control of images in Rise but it’s not something available right now. I’ve included your question in the feedback to our product team. If I can help with anything else, please let me know. If you'd like to share more about the kind of capability you are looking for you can do so here. Please let me know if I can help with anything else! "I too would like the ability to download the full, high-resolution ..."
"That's a great suggestion, Tom. I'll pass it along! And in case y..."
"Hi John, Correct - Rise doesn't have that feature to adjust the co..."